Maruiwi was formerly known as Moriori. The first ascent was by Jim Dawson, Bob Craigie, Phil Cook, and Scott Gilkison on January 7, 1939, from the Snow-White Glacier. From Whitbourn Saddle and Snow White Glacier either climb up the glacier or a snow couloir on the north face to the North West Ridge then traverse the West Face and complete the ascent up the snow face to the south; or climb the west snow face to the rock ridge on the Divide and follow this to the summit. 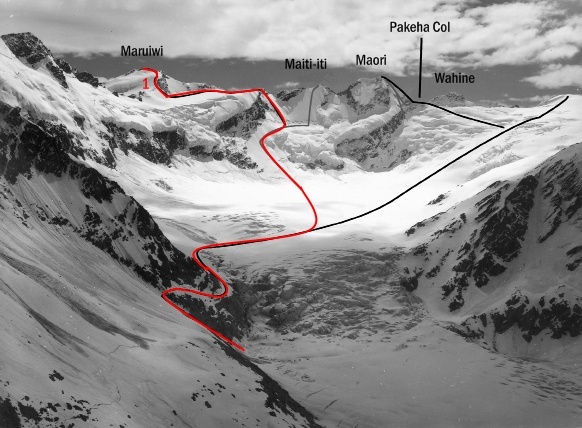 It appears possible to reach the extreme northern end of the Park Glacier by a steep snow face with an upper rock band, at the south-west end of the shelf of the hanging glacier beneath Maiti-iti and Maori. From the Park Glacier the summit could he reached by easy snow routes on either the North East or South Ridges.